Maybe a name is destiny. Saint Valentine, for reasons relatively obscure to historians, has been associated since the Middle Ages with the traditions of courtly love. Rudolf Valentino moved to Hollywood and became notorious as the great seducer of the silent film era. And Mr. Valentino knows a thing or two about romance: He is the maestro of the red gown, designing some of the most romantic dresses of all time. 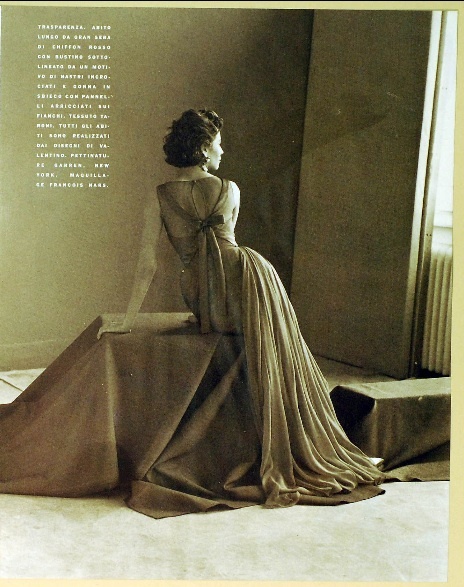 Consider, for instance, Mr. Valentino’s dress “The Dream,” which he designed in 1955. An evening gown in red chiffon, it features a heart-shaped bodice, a bow in back, and a long paneled skirt that all but begs to be twirled across a ballroom floor. Steven Meisel captured the allure of the dress nicely, when he shot Christy Turlington in a remade version of The Dream for Vogue Italia: In this photograph from 1991, the indelibly beautiful Turlington sits with her back to camera, staring wistfully out the window of an empty room. One imagines her silent contemplation of the voluptuous kiss she shared with her lover, who only just departed. Tim Walker is another photographer attuned to the romance of the red Valentino gown. 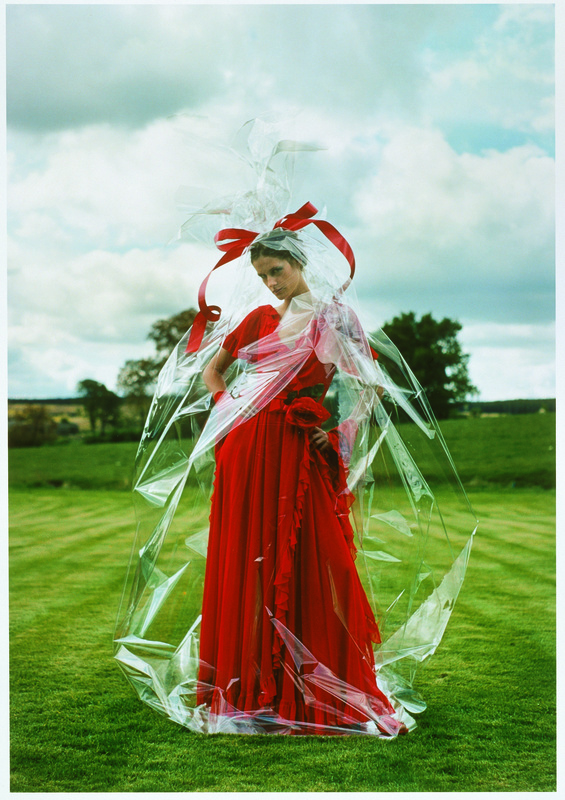 For Valentino’s Red Book, he shot model Lisa Ratliffe in a wrap-style gown from the haute couture Fall/Winter 1972 collection; the dress is a bit gypsyish, with a signature Valentino rose at the waist, and Ratliffe stands in a field gift-wrapped in cellophane, a woman desired yet just out-of-reach. Elsewhere in the Red book, Deborah Turbeville—that connoisseur of elegant anomie—captures Malgosia Bela in a vast red tulle gown from RTW Fall ’77. She poses like one lovelorn, in a courtyard lost to time, virtually drowning in the gown’s endless tiers of satin-edged ruffles. Mr. Valentino’s most romantic dresses are like great loves: They go all-out. Take the crinoline-skirted frock from his RTW Fall ’93 collection, inspired by the French “Café Chantant” (singing café.) Or the gown from the haute couture Fall/Winter 2002 collection, low-cut and spaghetti strapped and comprised of evanescent layers of chiffon that waterfall to the floor. Or the deceptively demure strapless gown from the RTW Fall ’04 collection, a slender sheath faille sheath that expands, in a sculptural swirl, from the knee to the floor. Most romantic of all? The two Valentino-signature roses on each hip, which conceal slim pockets the perfect size for concealing love notes. Happy Valentine’s Day!